India Dry Type Transformer Market size for 2016 was valued over USD 100 million and is set to witness an annual installation of over 20 ‘000 units by 2024. India dry type transformer market will gain appreciable momentum owing to the consistent economic and demographic escalation across the nation. As reported by leading publications, India since 1990 has contributed for over 9% in the global economic output. The ongoing economic progression has led to the rise in the overall energy consumption which in turn will positively influence the industry outlook. Furthermore, building up of a manufacturing base & ongoing urbanization coupled with ambitious government plans to integrate a sustainable energy infrastructure will institute a favourable business scenario. Consistent and coherent energy policies notified by the National Action Plan on Climate Change, the planning commission, and the Integrated Energy Policy, fuel the expansion & upgradation of existing T&D networks. Therefore, favourable regulatory inclination towards the establishment of a sustainable T&D infrastructure will foster the India dry type transformer market size. Furthermore, increasing focus on the adoption of modern component technologies coupled with bulk production integrated manufacturing schemes will considerably foster the industry growth. 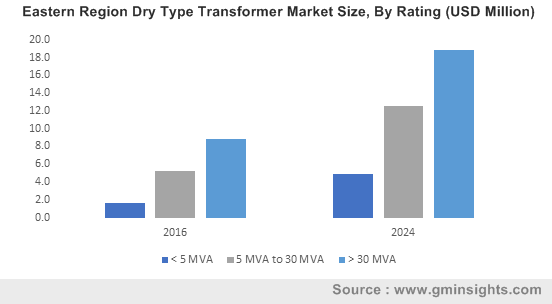 Closed core dry type transformer market is projected to reach an annual installation of over 15 ’000 units by 2024. Sustainable transformation capacities coupled with effective operational life expectancy have accelerated the product adoption. However, advanced smart technologies along with concerns pertaining to energy efficiency have led to the introduction of a variety of substitute core technologies. Self-air subject to comparatively smaller transformation capacity have gained appreciable unit deployments in the recent past. These units have effectively been installed across residential and small scale commercial electric networks. Comparatively lower price and ease of installation are few indispensable parameters evaluated to justify the soaring product adoption. Class R transformers are deployed across applications with comparatively higher temperature gradient and peak load demand. These products have gained significant industry penetration owing to their effective dielectric strength and temperature withstanding capacity. Industry participants have continuously been focusing towards the enhancement and upgradation of these transformer units with an aim to suit higher transformation capacities. Cast resin dry type transformer in 2016, accounted for over USD 15 million. Safe operational performance and rapid technological enhancements will positively impact the industry growth. The industry participants have continuously been focusing towards efficiency improvement and expansion of product applications. Thereby, ease of manufacture coupled with volume manufacturing practices adopted by the leading participants will stimulate the product demand. Single phase dry type transformer market is projected to witness a growth over 11% by 2024. Urbanization in coherence with favourable government initiatives to ameliorate the distorting small-scale industries will stimulate the business growth. The ongoing integration of sustainable energy networks adhering to the regulatory reforms including FITs and incentives to nourish their adoption will complement the industry outlook. 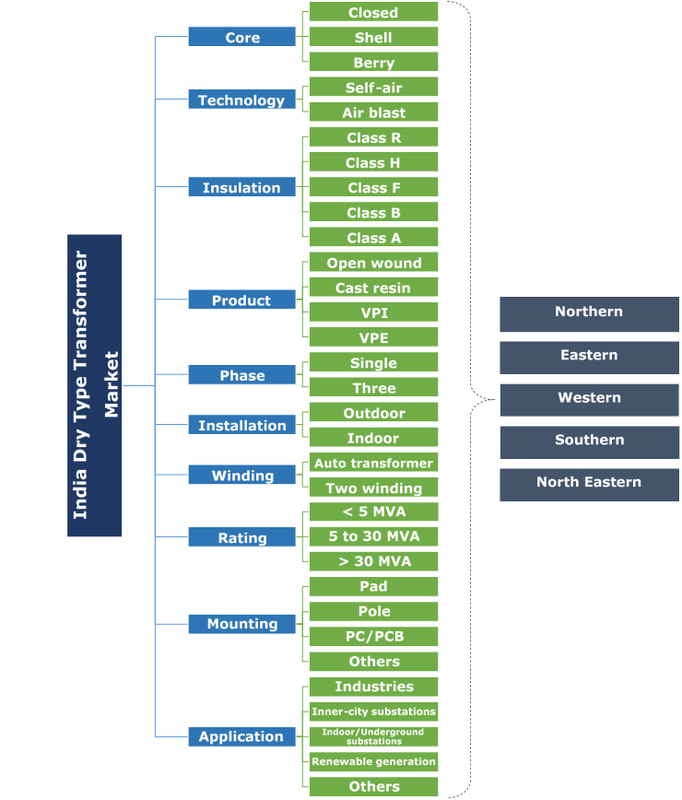 Rising space constraints owing to the ongoing refurbishment & retrofitting of the existing electric infrastructure will positively influence the indoor dry type transformer market size. The flourishing real estate industry owing to the exponential rise in private and public investments will boost the product adoption. As per Investment Bank Equirus Capital, the Indian infrastructure sector has witnessed deals over USD 3 billion in the financial year 2016-17 as against USD 2.9 billion raised in financial year 2015-16. < 5 MVA products subject to compact size, low installation cost, and high demand from power, healthcare, and small-scale industries is set to gain appreciable adoption. These are primarily used during step-up and step-down of the electricity voltage for transmitting a comparatively lower quantity of reactive and active energy across the network. Effective reduction of ohmic losses and cross-sectional areas of the conductor will foster the dry type transformer market share. Pad-mounted dry type transformer units have gained an appreciable market penetration as large-unit installation require effective base foundation and earthing arrangements. These units have furthermore attained large-scale applicability across industries and utility establishments with short-distance transformation demand. Rapid urbanization along with favorable government reforms toward residential, commercial, and industrial expansion will enhance product deployment across renewable generation units. Enhanced on-site electricity generation technologies coupled with ongoing smart control networking initiatives will further complement the product demand. Western region in the recent years has undergone a significant change across power infrastructure which in turn has redefined the industry dynamics. Sustained economic escalation continues to drive electricity demand across the region. The Government of India have aligned their focus towards attaining ‘Power for all’ which has appreciably accelerated capacity addition. Consequently, the competitive intensity across the market and supply sides including fuel, finances, manpower, and logistics have gained an apprehension. Eminent participants across the India dry type transformer industry include ABB, GE, CG, Schneider, Toshiba, Siemens, Eaton, BHEL, Vijay Power & Control Systems, Sudhir Power, Synergy, Prima, Voltamp, Raychem, WEG, and Kirloskar. Product integrated R&D investments along with large scale manufacturing facility expansion have been the key strategies deployed by leading industry participants to sustain and enhance their growth opportunities. A dry-type transformer comprises of no moving parts and is entirely a static solid-state device, which usually insure a trouble-free and long operational life. Unlike liquid immersed transformers which utilize oil or liquid dielectric, these units integrate environmentally safe, UL and CSA regulated high temperature insulation.